LAS VEGAS, Nevada, July 9, 2010 (ENS) – Advanced utility-scale solar energy technologies soon will be tested at a sprawling federal site in the Nevada desert where nuclear weapons were tested 60 years ago. 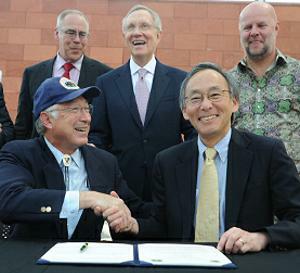 Energy Secretary Steven Chu, Interior Secretary Ken Salazar and Senate Majority Leader Harry Reid of Nevada gathered Thursday in Las Vegas to announce their agreement to turn 25-square miles of the former Nevada Nuclear Test Site into a Solar Demonstration Zone. Formerly known as the Nevada Proving Grounds, the site will now serve as the proving ground for new solar technologies. The new solar test site will be on lands owned by the Department of Interior’s Bureau of Land Management and administered by the Department of Energy’s National Nuclear Security Administration. “The Nevada Test Site is about to play a new role in securing America’s future, but instead of testing nuclear weapons, we will test new solar technologies that will help put America on a sustainable energy path,” said Secretary Chu at the signing ceremony at the University of Nevada, Las Vegas. “Working closely with the Department of Interior, and with the critical leadership of Senator Reid, we will demonstrate technologies that will lower the cost of solar energy, accelerate the pace of innovation, and help build a clean energy economy,” Chu said. The Energy Department will use the site to demonstrate innovative concentrating solar power technologies. CSP systems concentrate the Sun’s energy and capture that energy as heat, which then drives an engine or turbine to produce electrical power. The new zone will complement BLM’s establishment of 24 Solar Energy Study Areas on public lands across the Southwest by helping to ensure that the most advanced concentrating solar power technologies are ready for commercial deployment. “President Obama is committed to developing our nation’s new energy frontier, including the promising area of advanced solar energy,” Secretary Salazar said. “These projects on BLM land in Nevada can significantly reduce the costs and environmental impacts of utility-scale solar power facilities and demonstrate the commercial viability of these facilities,” said Salazar. The Energy Department selected this site after reviewing 26 possible locations, evaluating factors including solar conditions, suitable terrain, and existing infrastructure to support solar projects. Stakeholders, including state, tribal, and local governments, as well as local utilities, were consulted. “Nevada stands to be the leader in solar power production and technology development, especially with this kind of positive support from our federal partners,” said the senator. Solar Energy Industries Association President and CEO Rhone Resch applauded the site selection. “Solar energy is already one of the fastest growing industries in the world, and this project ensures that Nevada will be at the center of this booming industry,” he said. “Nevadans are well positioned to use their world-class natural resources and talented workforce to be an exporter of clean solar energy rather than an importer of hazardous nuclear waste and polluting fossil fuels,” said Resch. Resch said testing projects at the Solar Demonstration Zone can reduce large-scale solar system costs, increase their efficiency, enhance storage capacity and improve financing opportunities. The Energy Department is creating a new funding opportunity for demonstration projects at the Nevada Test Site that will include matching investments from the private sector. The federal agencies are coordinating with the U.S. Air Force and the Department of Defense to identify and address potential problems with locating and operating the Solar Demonstration Zone at the Nevada Test Site. The agency partners will conduct environmental reviews and coordinate infrastructure planning on the site. Chu and Salazar said the new zone also will test the viability of other solar projects proposed near military installations throughout the Southwest.